C4S Manual, Basalt Black with full extended black leather, sports seats and black suede roof lining. Options 454 Cruise control, 567 tinted screen, rare sunroof delete, 425 rear wiper, 635 Rear parking assist, 662 PCM, 689 CD Changer, P74 Litronic headlamps/washers, P89 Leather Sports Seats (Full Leather Interior). Very well maintained with massive file of works done. 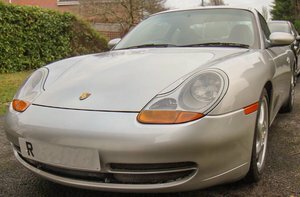 Recent major service and health check at Bournemouth Porsche new clutch, helper spring, engine mounts and RMS done this year. 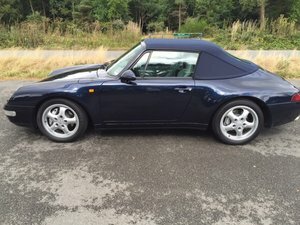 New Porsche supplied engine in 2008 at 86'000 miles with later IMS fitted and checked last month with clutch replacement (new engine has only covered just over 50'000 miles). New brakes last year has 4x Michelin Pilot Sports the rears have covered 2'000 miles only. Drives without fault. 2 keys and full book pack in wallet with all original tools. All original apart from touchscreen Pioneer Apple Car Play entertainment, GPS, Handsfree, original fully functioning Nav PMS included. I have recently spent about £3000 getting this car mechanically sorted and was going to keep it and watch values rise. 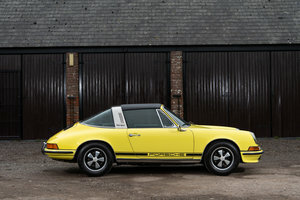 Now priced to sell quickly as I have bought a 997.2 C2S Cab and need the garage space. Any trial or inspection welcome.